We’ve been living at the Commons for almost a year and I’ve been curious how energy efficient our house really is. We spent extra money for a ductless mini-split heat pump, double paned Anderson-100 windows, a heat recovery ventilator, (all pictured here) blown in fiberglass insulation, energy star lighting and appliances, and I’m getting curious how much our energy bills are reduced by these measures. Of course I can’t answer that question because this is a new house, but I can compare how much we are paying now versus how much we were paying at the same time last year in our old, leaky, drafty Seattle house. I’ve done is gone back and compared our utility bills from roughly June 1, 2012 (when we moved in) to the present, with the equivalent bills from the same time the previous year. This entry was posted in Clearwater Commons and tagged Energy Conservation, Homes on April 16, 2013 by admin. 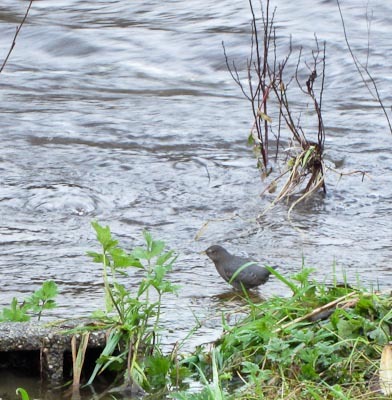 After many hours of rain, North Creek was overflowing its banks again, although it was not as high as it was a few weeks ago. Bob and I walked down to the creek edge this morning to see it. 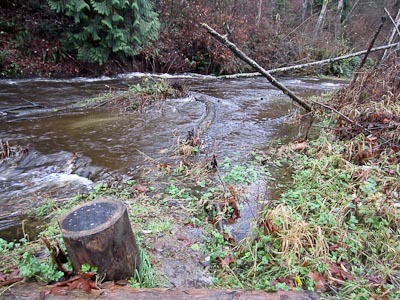 The power of that much water always feels exciting, and it’s fun to see how the bigger volume of flowing water has changed and shifted the contours of the banks and stream bed, not to mention loose objects beside the creek like the logs of the fire pit. 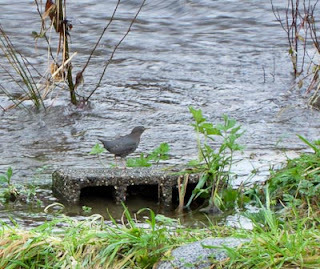 A cute little American Dipper was bobbing up and down at the flooded edge of the creek. It is such a soft gray and blends so well into the background of gray water that I didn’t see it until I had gotten fairly close to it. I stayed still and with no alarm, it continued to bob and poke into the shallow water for aquatic insects, their larvae, and maybe even tiny fish. This entry was posted in Articles, Clearwater Commons on December 1, 2012 by admin. The author was one of the principal architects of the Growth Management Act (GMA) in 1990 and a member of the Governor’s Land Use Study Commission. He is a consultant on public engagement strategies, a judge for the Governor’s Smart Communities awards, the chair of the Charlotte Martin Foundation, and a member of Clearwater Commons. This is the story of a growth management policy wonk turned developer. It is a high anxiety story of a successful effort to build one of the most comprehensive green low impact developments (LID) in the Puget Sound area – through some of the laws I helped to create. This arduous five year journey was made even more difficult by a housing recession; a complex web of new and complicated regulations; and, a reeling banking industry. This entry was posted in Articles, Clearwater Commons on October 1, 2011 by admin.